For staff to know how to reduce fire risks, deal with fires if appropriate and escape safely in the event of fire. The Health and Safety Group would recommend approx. 2 hour 30 minutes to complete the course. The Fire Safety Order requires that fire safety training is provided to staff when they commence employment and that refresher training is provided on a regular basis. Fire is often the biggest safety risk any businesses ever has. Without fire safety training your insurances may not be valid and your staff are left vulnerable. Don’t think a fire won’t happen to you, last year there were over 33,000 recorded fires in UK businesses and community buildings. Protect your staff now and give them the best chance of escape if a fire does happen. 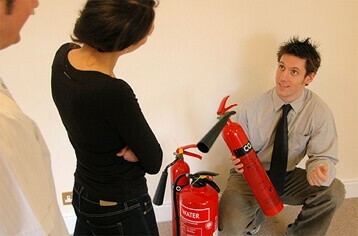 Fire Safety Training is not only a legal requirement, it also saves lives and protects businesses. Upon completion of this Elearning course, to thoroughly apply the knowledge gained it is recommended that delegates conduct a practical assessment of their workplace to highlight any workplace specific risks. This activity has been accredited by The CPD Standards Office and equates to 2.5 hours of CPD. Complete your order by selecting one or more courses. Once you complete your payment details you will receive an email that contains your username and password needed to access your online training portal. Order online with confidence using our secure payment system. Alternatively you can call us on 0345 369 1122 to place your order.